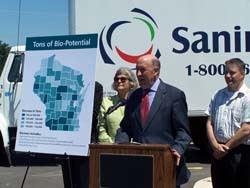 Governor Jim Doyle is calling on lawmakers to restore financial support for Wisconsin&apos;s bio-industries. That&apos;s after lawmakers on the Joint Finance Committee cut nearly $30 million worth of incentives for bio-based businesses out of Doyle&apos;s budget proposal. The Governor says Republicans aren&apos;t backing the proposal in the Assembly, with no indication it will be put in that version of the budget. Doyle says that money could bring the state over $300 million in private investments from firms looking to develop renewable energy and produce bio-based fuels here in Wisconsin. The Governor says lawmakers shouldn&apos;t let politics get in the way of a rapidly growing industry. Doyle says Republicans can&apos;t simply pay lip service to energy independence, while ignoring the needs of the industry to develop the technologies. Doyle urged lawmakers to support more funding Tuesday, during a visit to a bio-diesel plant in De Forest.